Danish Crown Plastic Silver cutlery will have your guests feeling like royalty! 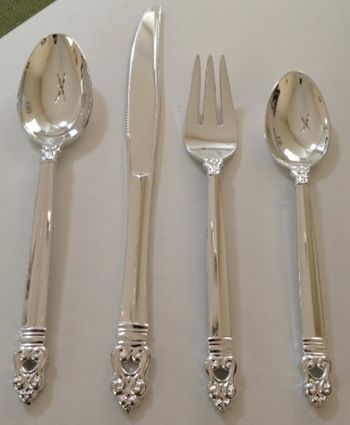 Danish Crown Plastic Silver Look Teaspoons 20ct. Danish Crown Plastic Silver Look Forks 20ct. Danish Crown Plastic Silver Look Knives, 20ct. Danish Crown Plastic Silver Look Dessert Forks, 24ct. Danish Crown Plastic Silver Look Dessert Spoons, 24ct.